Sclerotherapy is a non-surgical medical procedure to treat spider veins and small varicose veins in the legs. The procedure involves the doctor injecting a chemical, called a sclerorant (irritant) into the affected veins to irritate the endothelium, the tissue that lines blood vessels, causing the vein to collapse and forcing blood to route through healthier veins. The collapsed vein is then reabsorbed into surrounding tissue and fades over time. It does not require anesthesia and usually takes 15 mins to an hour to complete depending on the extent of the veins. There is no down time and will be able to return to your normal activities. 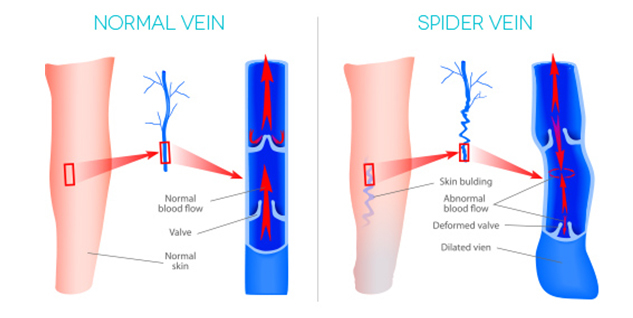 According to a 2014 study published in Circulation, approximately 23% of adults in the United States suffer from variscose veins, while more than 80% experience varicose or spider veins. Sclerotherapy is one of the safest and most common treatment of choice for superficial spider veins on legs because its faster and more effective than laser treatment. The procedure can improve related symptoms such as aching, swelling, burning and night cramps. Treated veins tend to fade within a few weeks, although occasionally it may take up to two months to see the full result. OCWMG’s product of choice : Asclera® an FDA-approved sclerosing injection. It is indicated to sclerose uncomplicated spider viens (varicose vein < 1 mm in diameter) and uncomplicated recticular veins (varicous veins 1 to 3 mm in diameter) in the lower extremity.